Yesterday I did finally go grocery shopping and stocked up on produce and other things. I bought 2 nice leeks. 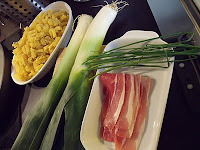 I usually make a leek and potato soup, but a couple of years ago I started experimenting with leeks as a condiment for pasta. Today's recipe is for "Pasta con porri, pancetta e panna". I promise to make some other tomato sauces and maybe even some filled pasta dishes soon! about 4 slices of bacon, the bacon I get here is not smoked, but smoked bacon would be delicious as well! 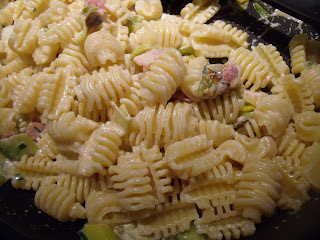 1 lb short pasta, I am using "radiatori" which I like because they have lots of "nooks and crannies" to hold the sauce! First off, put your water on to boil. 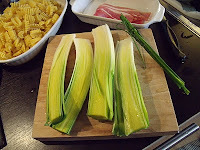 Then wash your leeks well, removing all of the tough green part (which you can save for when you make vegetable stock). Here the leeks come from Holland and are quite sandy, so they must be rinsed well. Next, chop your bacon ( I remove as much fat as possible, we are all on low fat diets here, trying to keep that cholesterol down!) and put it in your large fry pan with a couple of tablespoons of extra virgin olive oil. 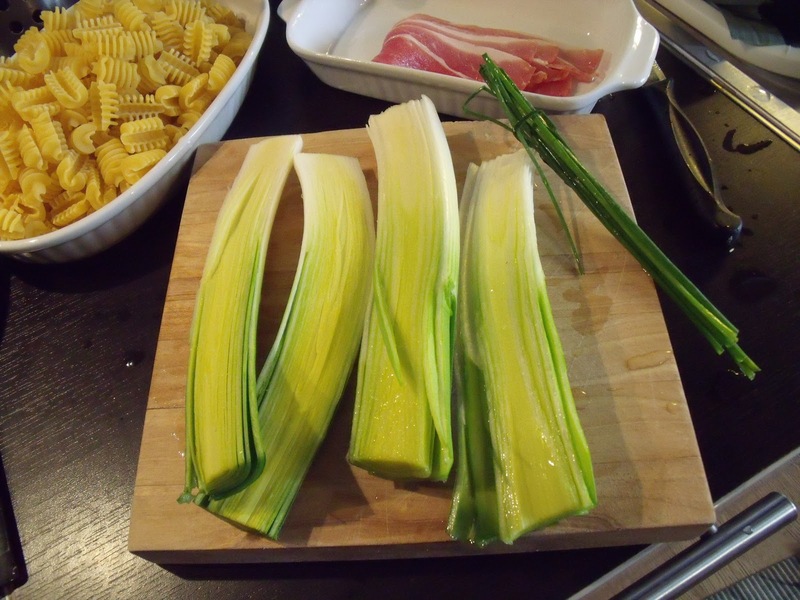 Cut the leeks in half lengthwise and then cut them in 1/4" slices. 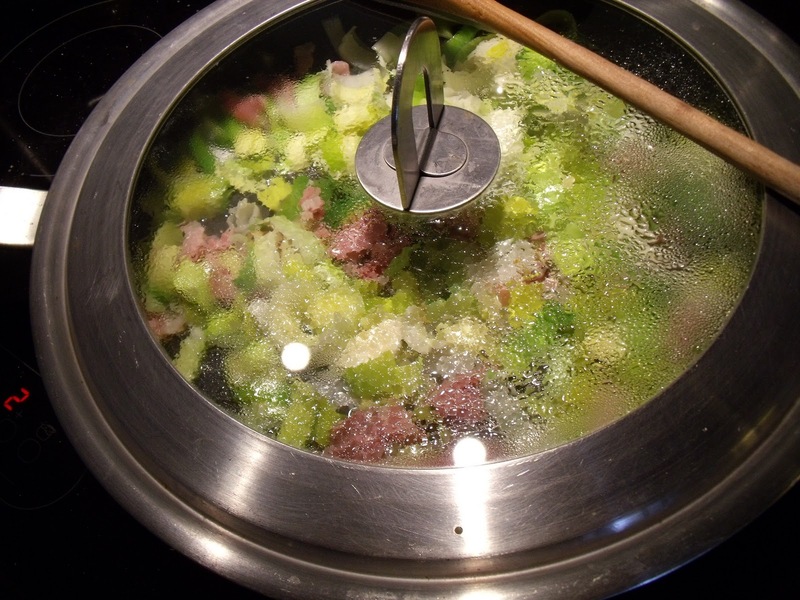 Once your bacon gets going, add the leeks and sauté for several minutes. When the leeks start to get soft, add the white wine. By now the water is boiling, so salt it and put the pasta in to cook. While the pasta is cooking, stir the leeks and bacons every once in a while. Taste and add salt if necessary. You may not need any salt, because the bacon is usually salty enough! If you like black pepper, now is the time to add it. When the leeks are tender and the wine has evaporated, add the cream and chives and turn off the heat for now. 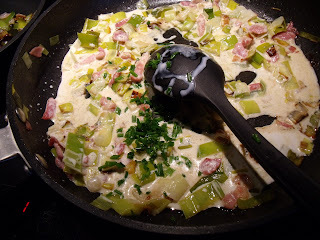 I removed some of the leeks and bacon to another pan, because my husband does not like cream sauces, so I will season his past with just the leeks, bacon and some chives. as Julia Child would have said, had she spoken Italian...BUON APPETITO! I was just talking with my mom - my best critic and fan! and she said to suggest some cream substitutes for people in the States where you can't get cream substitutes like we have here. I suggested the no-fat half 'n half that they sell there, or even sour cream with no fat would be delicious, I am sure. Of course, 1/3 cup of light cream divided amongst 3 or 4 people is not really that fattening, is it?! I'd rather eat than cook but your blogs look so easy even I could cook some of these things. Bravo! Nicely done. Love the pix, video, and interesting personal bits, too. I hope someone picks up on your blog and you become an overnight sensation. Too kind, my dear friend!